That’s the question Noel Edmonds used to ask on his TV Gameshow. Right now, it feels like the UK is on a gameshow just like that one. What kind of Deal is Theresa May pursuing? One that is ‘frictionless’? One that is ‘deep and special’? One that ‘secured the place of Global Britain”? It also depends who you ask. is Theresa’s ‘Deal’ the same as Boris’s ‘Deal’, nd what ‘Deal’ is Jacob wanting? Have any of them paused to think that to get a ‘Deal’, any ‘Deal’, needs the other side/party to agree to it? What kind of ‘Deal’ does the EU want? Do you think they might have a view on the ‘Deal’ the UK will end up with? Adjacent is a picture I copied from Paul Mason’s twitter feed. It shows the HM Treasury regional impact analysis Brexit is forecast to have. Paul Mason rightly points out that a logical explanation for the causes of the downturn in the different regions is easy to see. 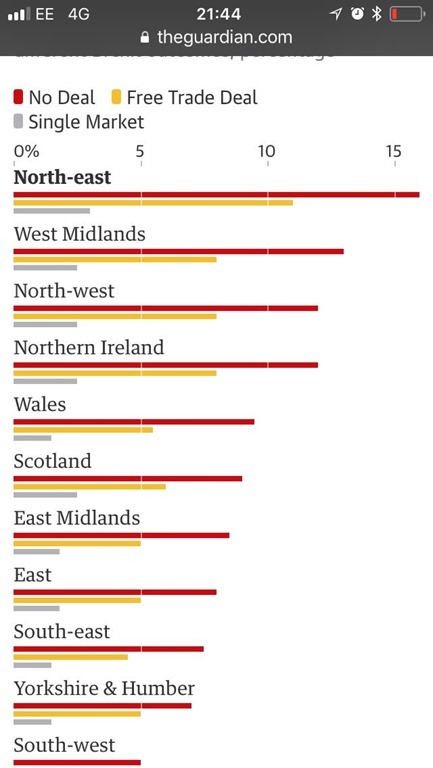 What could wipe 15% of the North East of England? Easy – Nissan. What could wipe out the NW – equally easy – BAE and in N.Ireland – Bombardier. In the Midlands – it’s Jaguar Land Rover and Toyota. What have all of these got in common? They make stuff. they rely on just-in-time deliveries as part of a pan-EU supply chain. Brexit, of whatever ‘Deal’, will break those JIT supply chains. Whereas the UK was a springboard to Europe post-Brexit it will not be so. And this is before we get serious about understanding what trading under WTO rules actually means. To me, it looks like the Tories are returning to finish the job Thatcher started. That is to finally destroy major manufacturing industry in the UK. It just doesn’t look like they “get” the importance to a balanced economy of having a strong manufacturing sector. I mean, I’m sure Germany would get along fine without Siemens, Bosch, BMW, Mercedes, Volkswagen, BASF, Bayer, Continental, etc etc. I started this post in the land of a TV Gameshow, I think it’s more like we’re in a land of a hit musical number …… I wonder if Lord Lloyd Webber had our current mind-bending circumstances in mind when he wrote it……. me, I think it’s more of a nightmare than a dream….